Geographical variation: Two subspecies: the nominate Pt. m. macroptera breeds at Tristan da Cunha, Gough, Prince Edward, Marion, Kerguelen and Crozet Islands, and islands off Western Australia; Pt. m. gouldi breeds only in New Zealand. 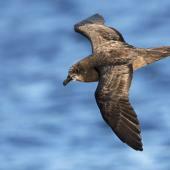 The grey-faced petrel is an-all dark oceanic seabird with a short but powerful deeply hooked beak. 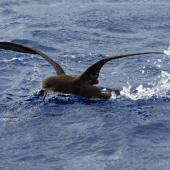 At sea, it is fast and graceful with a high soaring powerful flight on long narrow wings. 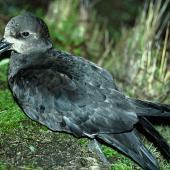 Grey-faced petrels breed around northern New Zealand, on islands as well as a few mainland headlands. 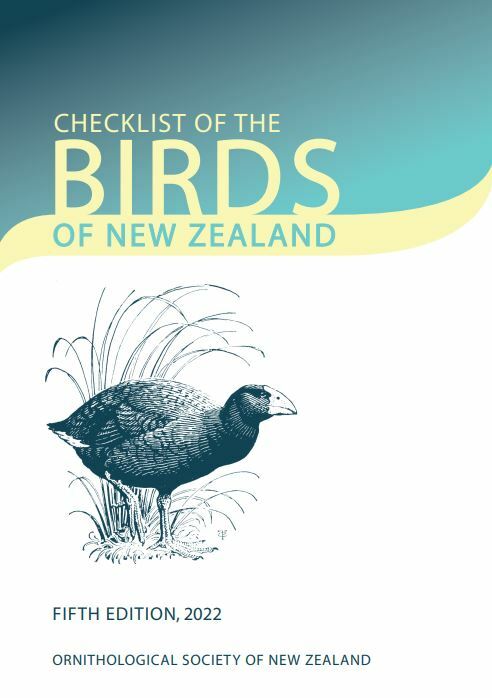 The birds begin breeding in the middle of winter, but many chicks don’t fledge until the height of summer. 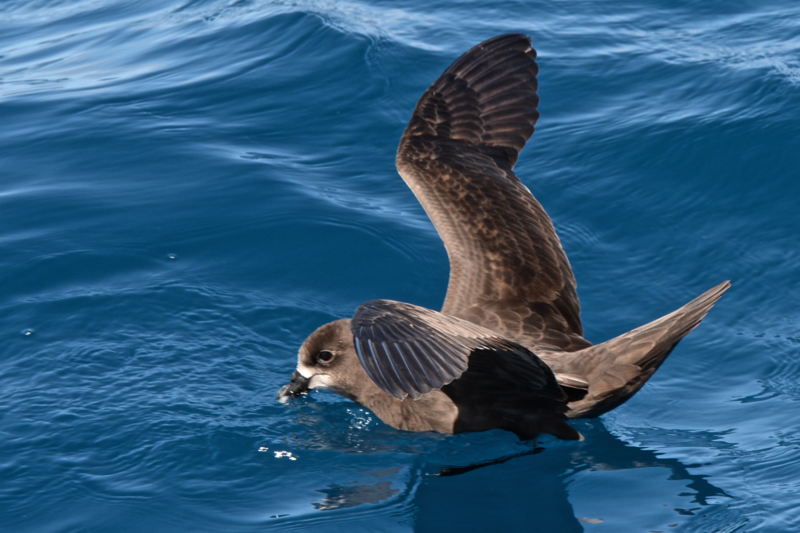 The grey-faced petrel is sometimes referred to as the northern muttonbird, and some iwi still exercise their rights to harvest the petrel chicks between mid-November and mid-December each year. 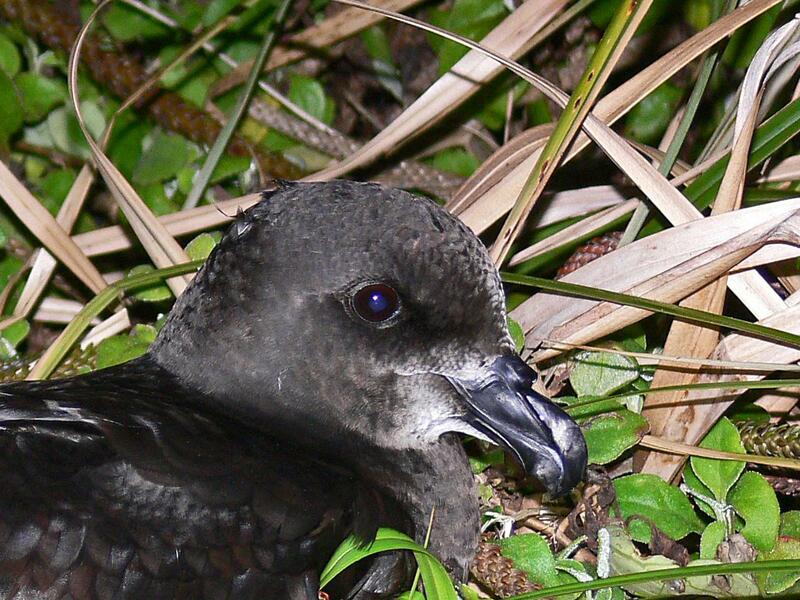 Grey-faced petrels are making a comeback as many breeding islands have been cleared of pests. 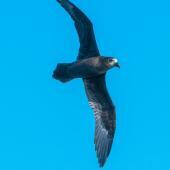 The grey-faced petrel is a large dark gadfly petrel with long narrow wings and a long pointed tail. 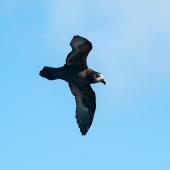 The entire body is uniformly dark black-brown but with occasional paler brown worn feathers. The base of the bill and throat are either grey or buff-white. 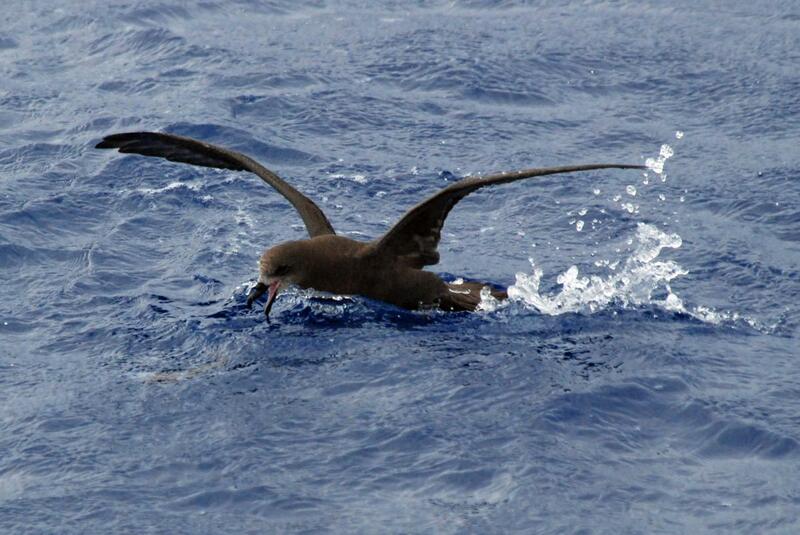 In the hand, the stout black bill (33-40 mm long) has a large sharp hook that can slice through squid and the hands of those holding these birds. The eyes and legs are black. Voice: the main flight calls are high pitched whistles whis-her, wik-wik or low moans oor-wik. 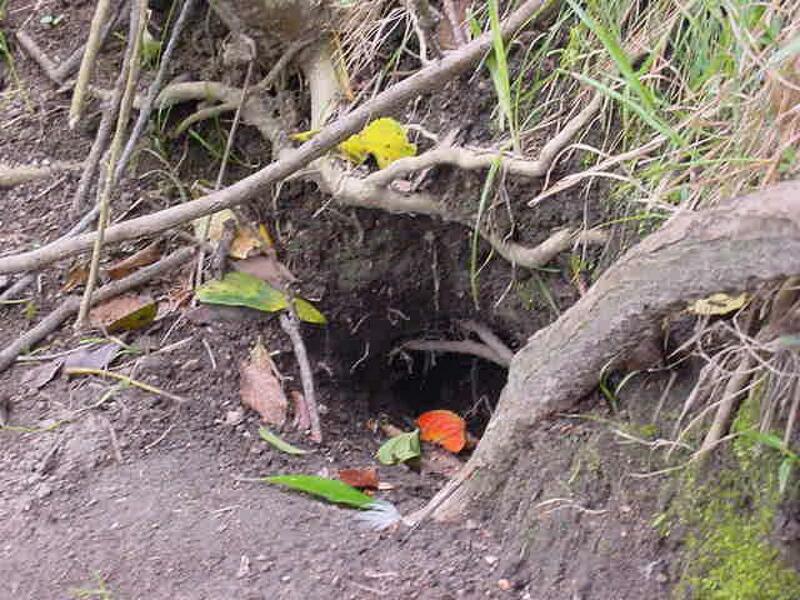 These same calls are given frequently on the surface or from burrows. 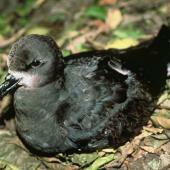 Similar species: other all-dark gadfly petrels are rare in New Zealand coastal water. 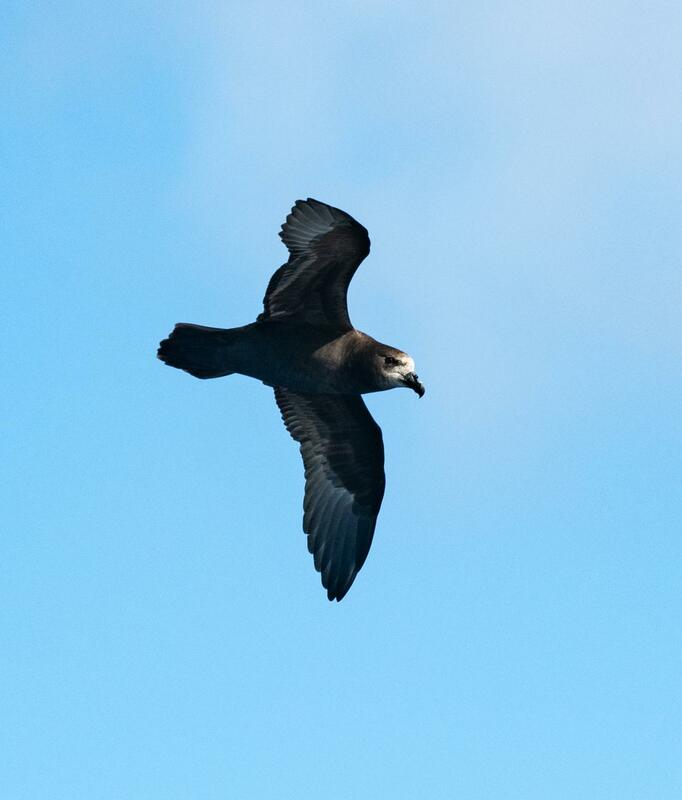 Providence petrel is greyer and has white flashes on the underwing. 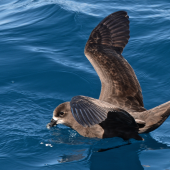 Dark morph Kermadec petrel is smaller with a shorter tail and white shafts on the primaries. 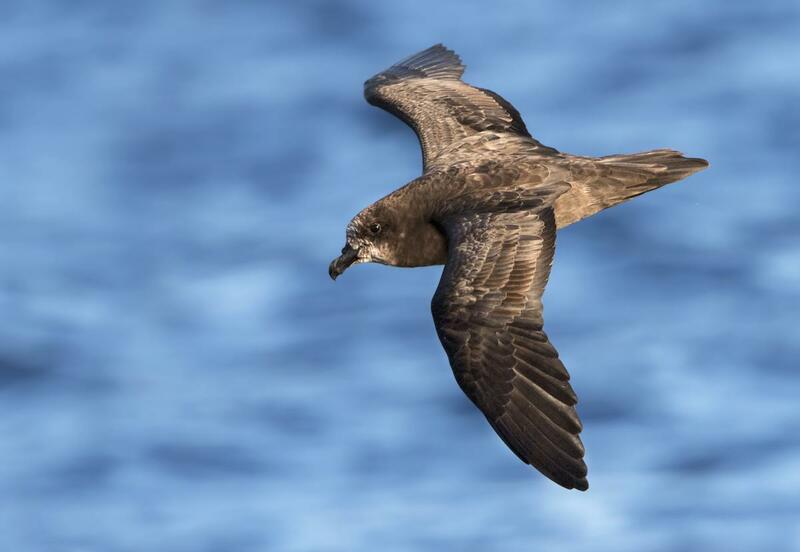 Kerguelen petrel (most likely to occur August-October) is smaller with a shorter bill and glossy grey sheen on its plumage and silver-white leading edge on the underwing. 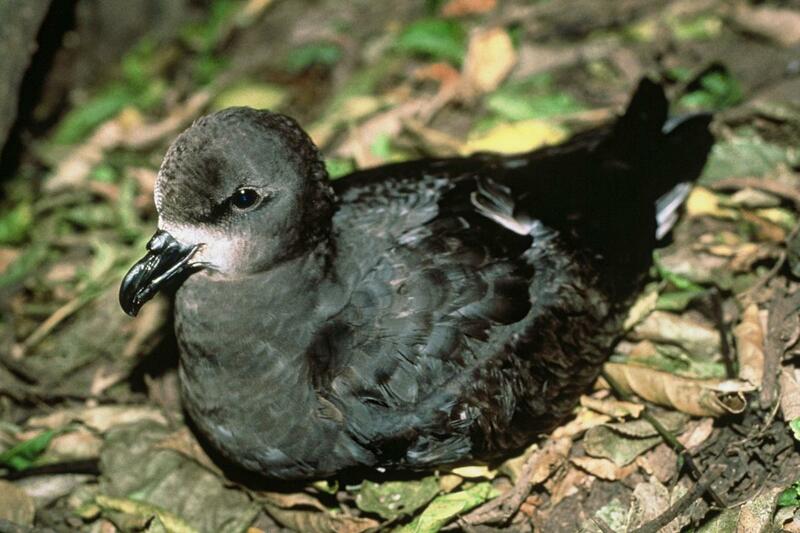 Grey-faced petrels are one of the few burrowing petrels to still survive on the New Zealand mainland. Small colonies are scattered around the coasts of the upper North Island, mainly on headlands and peninsulas adjacent to the sea. Over 100 colonies are still present but most sites have fewer than 500 breeding pairs. The largest colonies occur on the Three Kings, Hen and Chickens, Mokohinau, Mercury and Alderman Island groups, and also on Cuvier, Moutohora, White and East Islands. 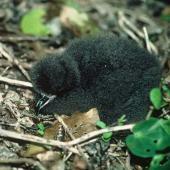 Nests are mainly in burrows under tall forest, but also under grass or shrublands, especially near cliffs above the sea. Sandy or friable soils with few rocks and tree roots are preferred. 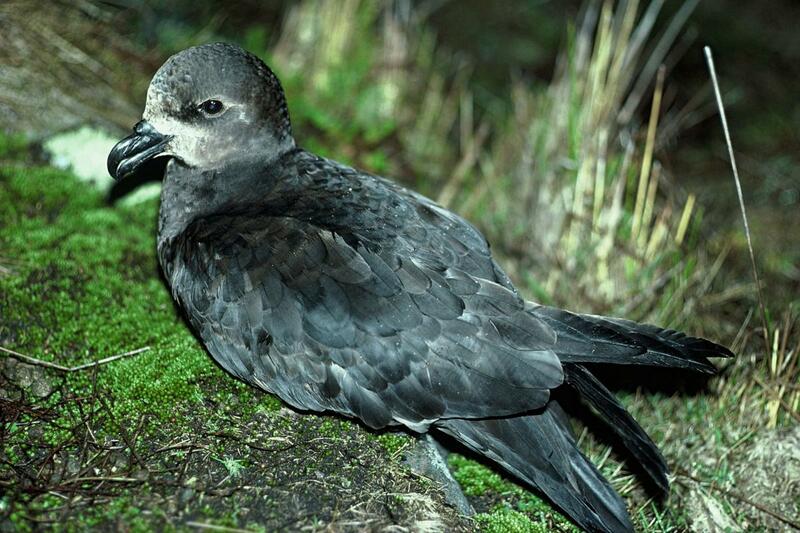 During the breeding season, grey-faced petrels feed mainly in the Tasman Sea or east of New Zealand, around the continental shelf edge or over deeper oceanic water, ranging thousands of kilometres. 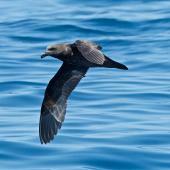 During the summer moult period, they disperse widely across the Tasman Sea to the coast of Australia, and some reach the Coral Sea. The largest colonies are on Moutohora Island and Hongiora Island in the Bay of Plenty. Over 100,000 pairs breed on these two islands combined. Elsewhere there are many smaller colonies with mostly less than 500 pairs but some of the larger islands have 1000-20,000 pairs. The world population is estimated to be 200,000 to 300,000 pairs. 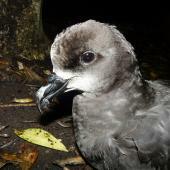 The major threat to grey-faced petrels is mammalian predators on their breeding grounds, especially feral cats and rats. Many former colonies have been lost due to predators, and some mainland colonies are sustained by immigration from island colonies. 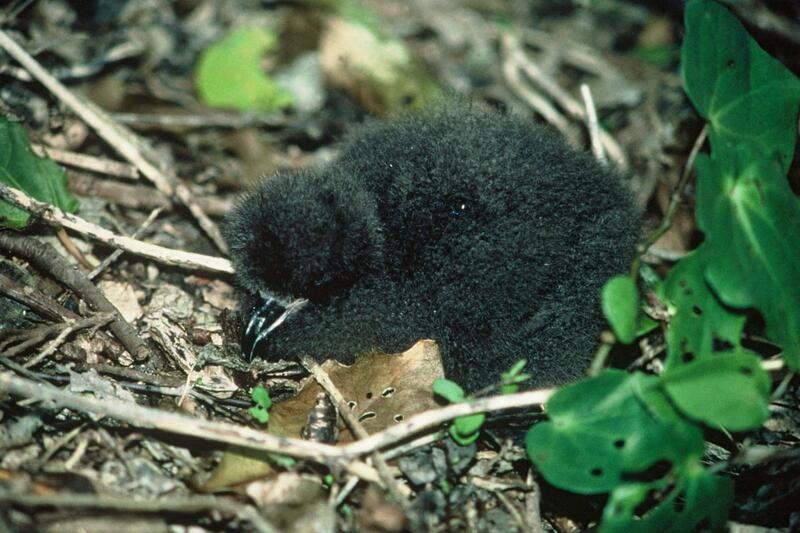 Eradication of rats from islands has benefitted grey-faced petrels at many sites, as rats take eggs and chicks. 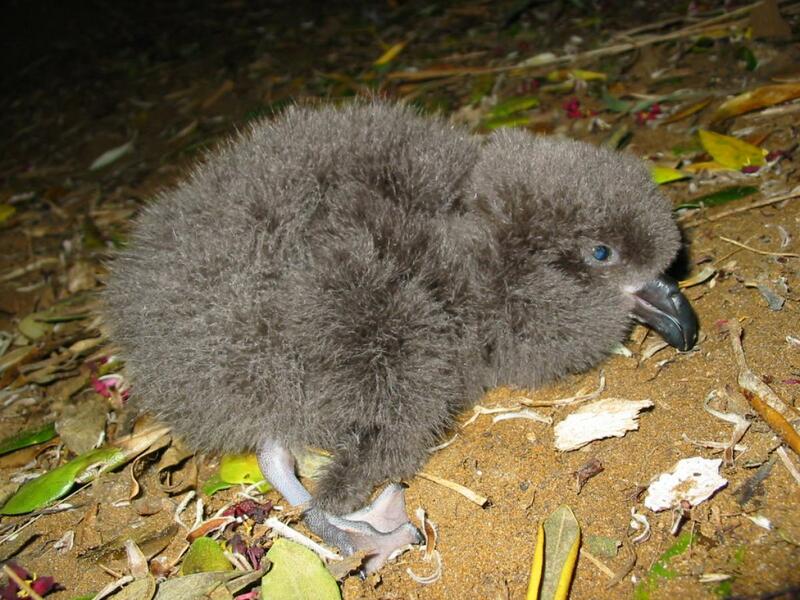 A small colony at Rapanui in Taranaki has been protected by the building of a predator-exclusion fence. 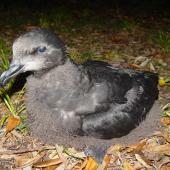 Long-term studies of grey-faced petrels at several sites have improved our understanding of the ecology of this species. 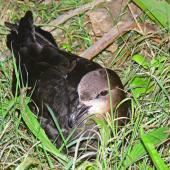 The information obtained supported the conservation of the related and critically endangered Chatham Island taiko. These studies included captive-rearing trials, testing of tracking devices, long-term marking projects and research on the breeding biology and diet. 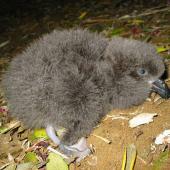 Translocations of chicks to establish new colony sites have been attempted but are still in the early stages of chick returns. 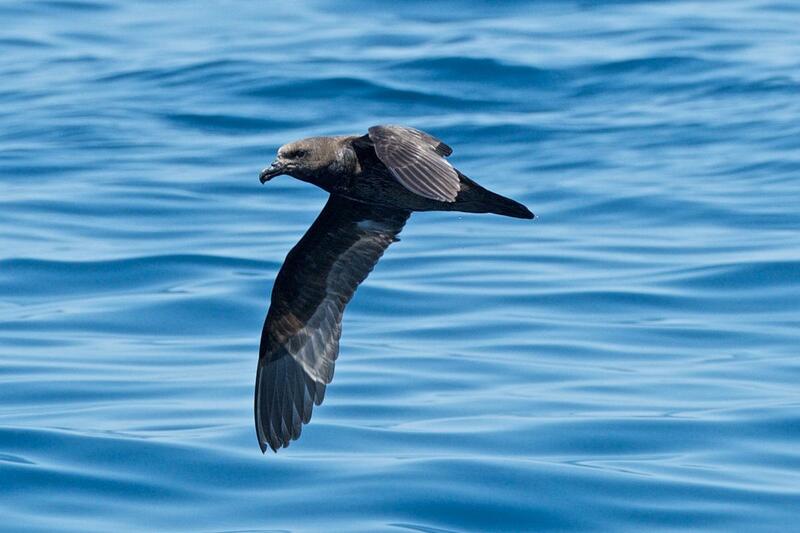 Grey-faced petrels occasionally follow fishing boats and sometimes occur as by-catch on long-line fisheries. 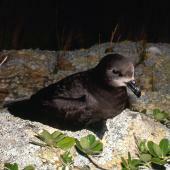 The breeding biology of the grey-faced petrel is well known from several long-term studies. 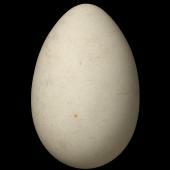 The season is broadly March to January with the single white egg (68 x 48 mm) laid between mid-June and late July. 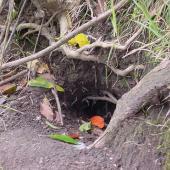 The well-lined nest chamber is at the end of a long burrow dug into soil, or amongst vegetation. 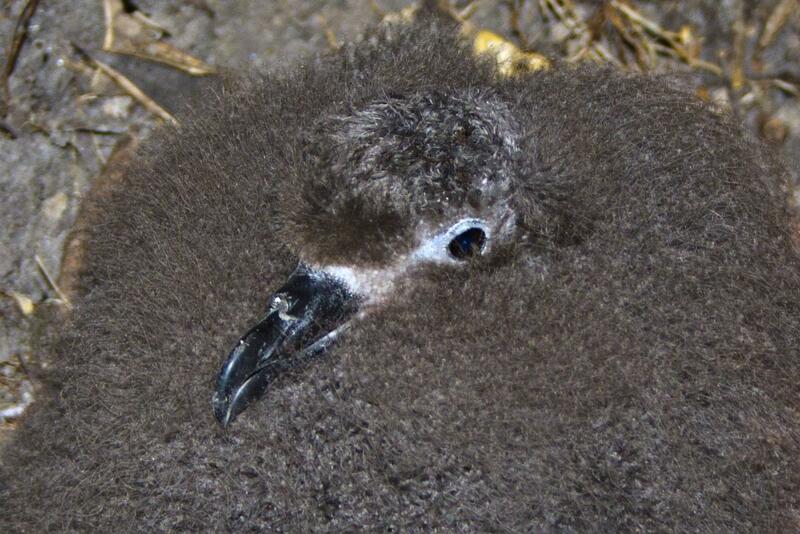 The egg hatches in August or September after c.55 days of incubation, and the chick fledges between November and January at c.118 days-old. 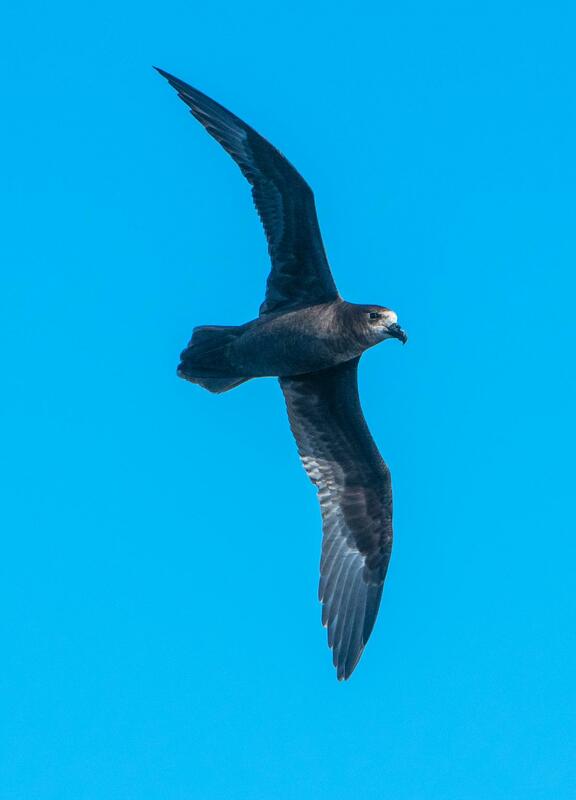 Grey-faced petrel mostly breed annually; very few pairs skip a breeding season. Incubation and chick-care are shared. 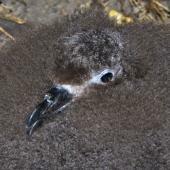 The chick is independent of the parents at fledging. Immatures begin to return to colonies at 3 years of age and can breed as early as four years of age but most delay breeding until they are 8-10 years old. 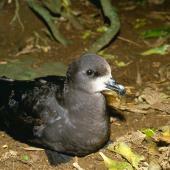 Grey-faced petrels are nocturnally active at the breeding grounds. 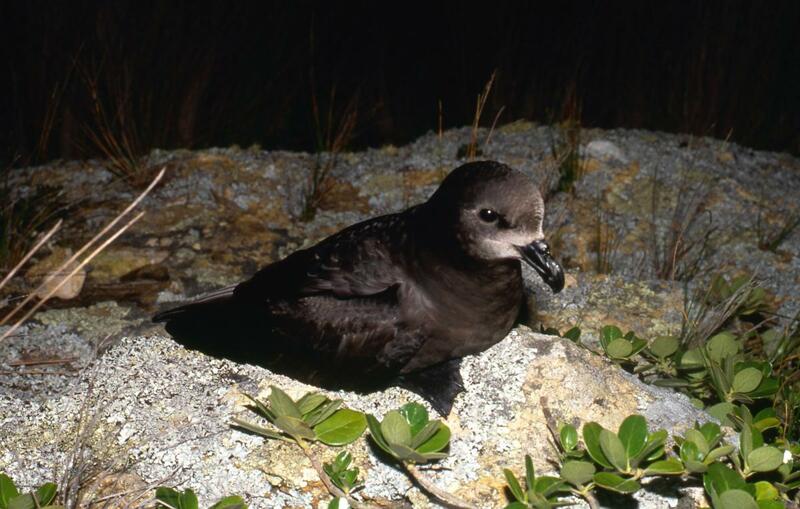 Unlike their relatives on southern islands, grey-faced petrels are very active on the colony surface at night, with birds calling, prospecting for burrows, displaying and sleeping ashore. 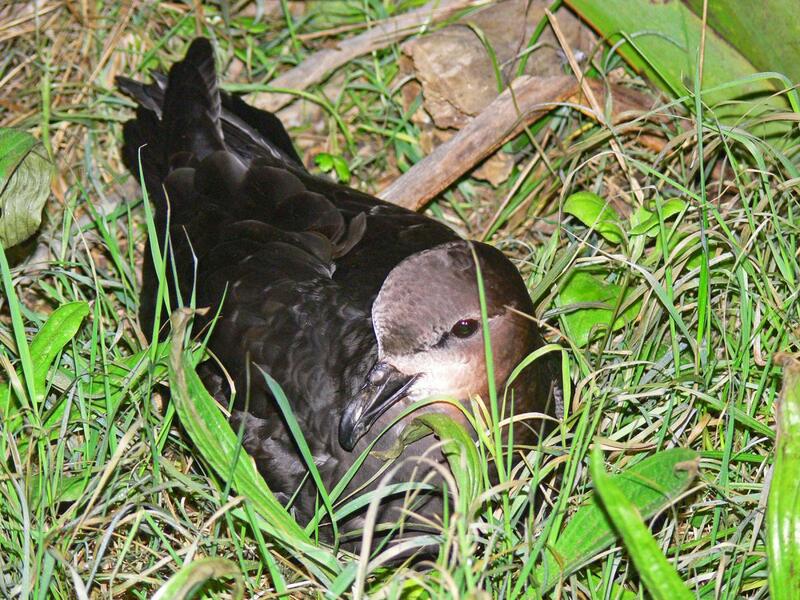 Activity ashore is more pronounced on dark nights during periods of wet weather, but birds will return in bright moonlight on windy nights. Spectacular aerial courtship chases over the colony are a feature of this species and the breeding sites can be quite noisy during April/May and again in August. 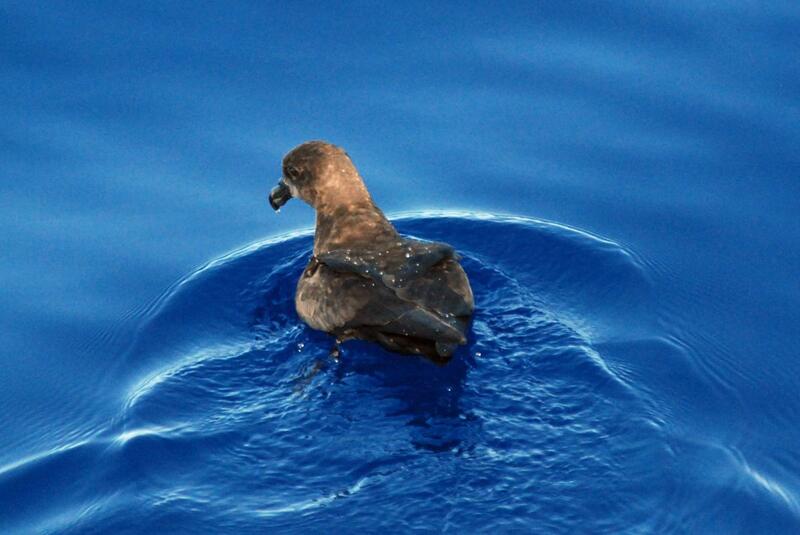 At sea, grey-faced petrels fly rapidly out to the continental shelf edge before they begin foraging for food. 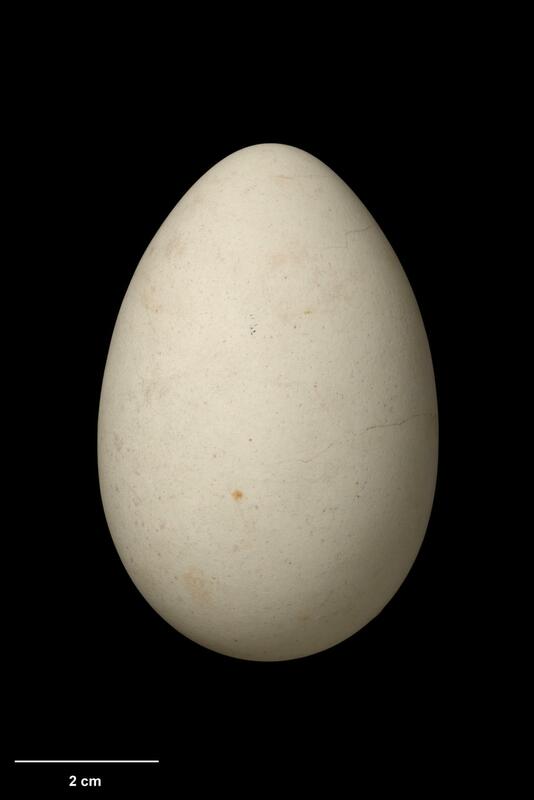 They can cover large distances in their quest for food with birds recorded flying to the east coast of Australia while their partner is sitting on the egg. 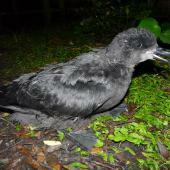 After breeding the birds disperse mainly to warmer water in the North Tasman Sea or off southern and eastern Australia. 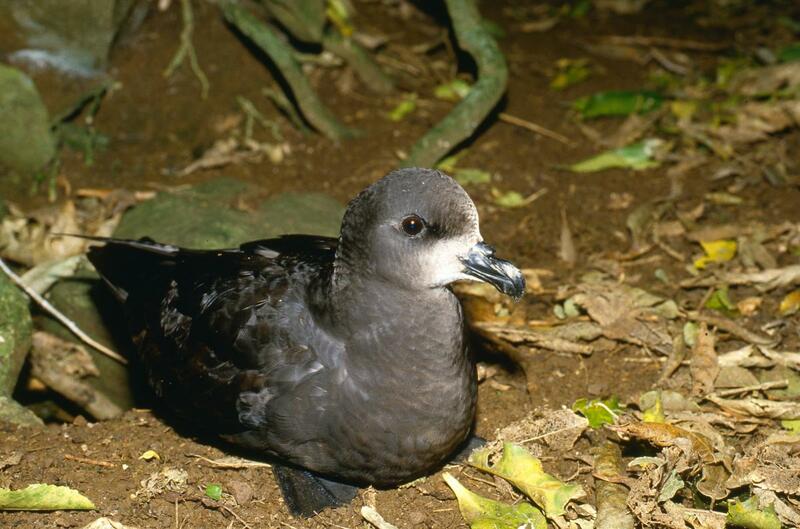 Grey-faced petrels are generalists feeding most often on squid but they also eat crustaceans and fish. 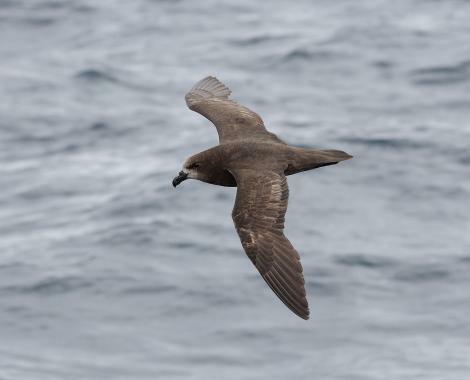 They have been observed capturing prey at night but activity recorders also show they frequently alight at sea during the day and presumably take prey. Smaller squid are captured alive on the surface, but larger squid are probably scavenged when dead animals float to the surface. Studies of the diving ability of the species reveals they mainly feed in the top 5m of the water column but are capable of occasional deeper dives, perhaps down to 20 m.
Imber, M.J. 1973. The food of grey-faced petrels (Pterodroma macroptera gouldi (Hutton)), with special reference to diurnal vertical migration of their prey. Journal of Animal Ecology 42: 645-662. Imber, M.J. 1976. 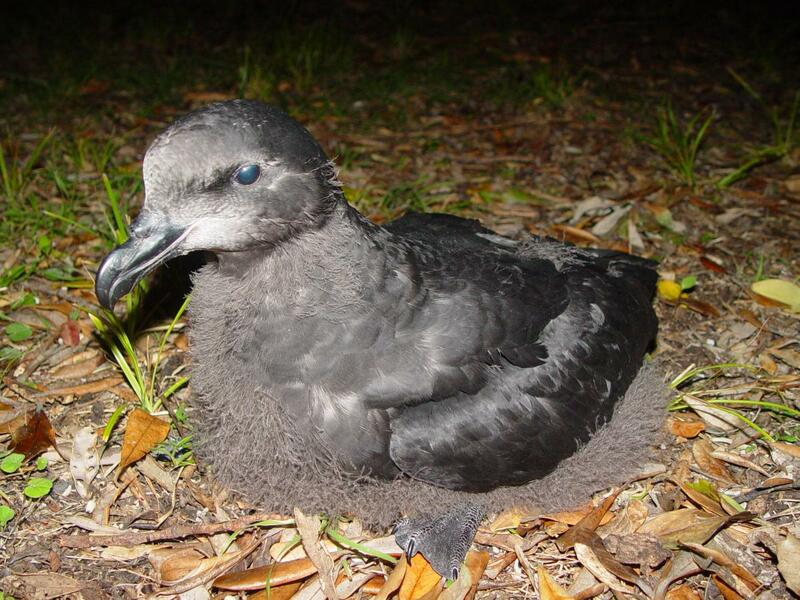 Breeding biology of the grey-faced petrel Pterodroma macroptera gouldi. Ibis 118: 51-64. Johnstone, R.M. ; Davis, L.S. 1990. 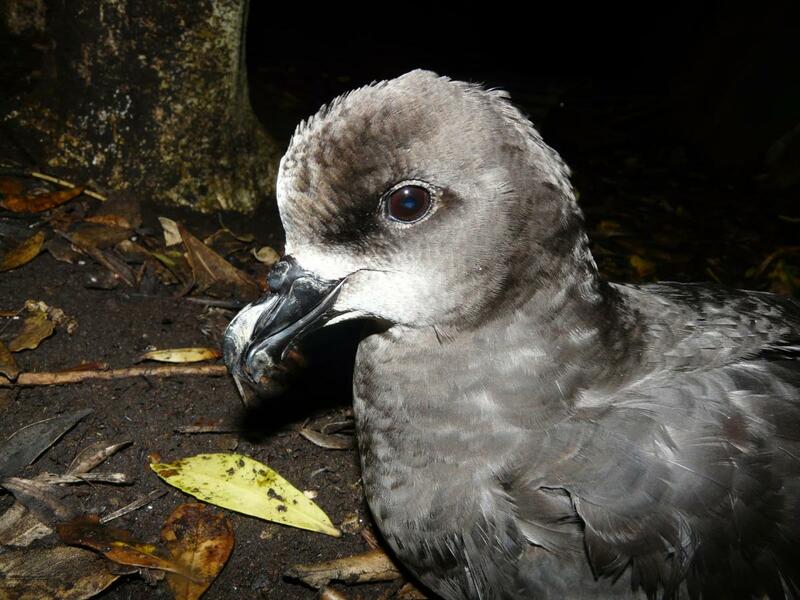 Incubation routines and foraging-trip regulation in the grey-faced petrel Pterodroma macroptera gouldi. Ibis 132:14-20. MacLeod, C.J. ; Adams, J.; Lyver, P. 2008. 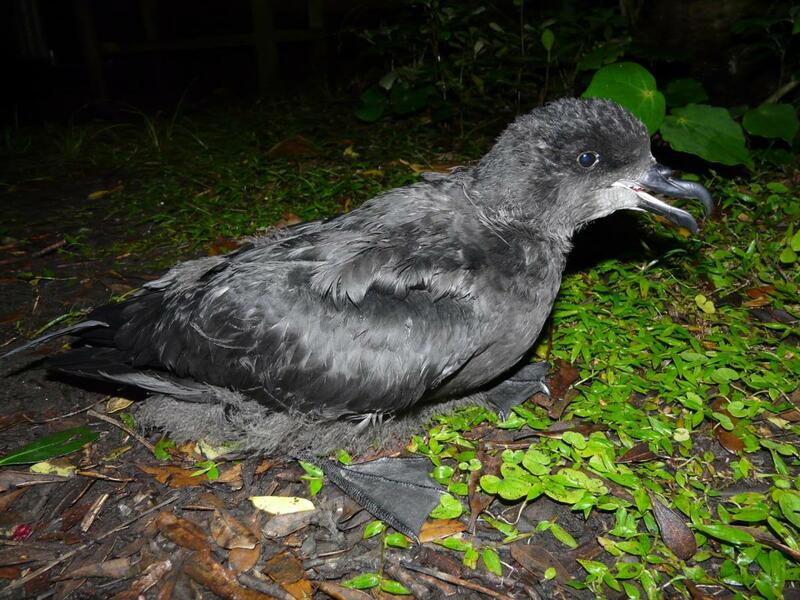 At-sea distribution of satellite-tracked grey-faced petrels, Pterodroma macroptera gouldi, captured on the Ruamaahua (Aldermen) Islands, New Zealand. Papers & Proceedings of the Royal Society of Tasmania 142: 73-88. Onley, D; Scofield, P. 2007. 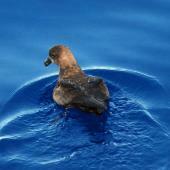 Albatrosses, petrels and shearwaters of the world. Princeton University Press, Princeton. In sandy or clay soils, chamber lined with leaf litter and twigs. 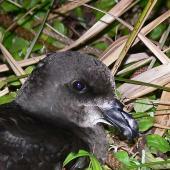 A large dark gadfly petrel with uniformly dark black-brown body with occasional paler brown worn feathers, long narrow wings, a long pointed tail, and black eyes and legs. The stout black bill has a large sharp hook and the base of the bill and throat are either grey or buff-white.